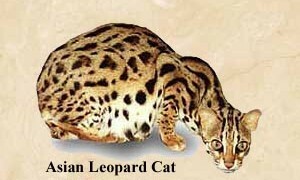 Alles begann in Amerika, als die Biologin Jean Sudgen eine ALC( = Asian Leopard Cat) mit einer Hauskatze (Felis Catus) verpaarte. zwei Kitten - einen spotted Jungen und ein Mädchen. 1966 gab sie ihr erstes Zuchtprogramm aus privaten Gründen auf. In den siebziger Jahren führte man ein Testprogramm mit der ALC durch. Jean Sudgen erhielt mehrere getupfte F1 Weibchen und ließ alle bei der TICA (= The International Cat Assocation) registrieren. Mit diesen Foundation (lat. Begriff: filius ) Bengalen begann sie noch mal von vorne, aber es vergingen viele Jahre, bis man herausfand, dass die männlichen F1 Bengalen steril waren. Aber auch bei den männlichen F2 Nachkommen war es nicht anders, nur weibliche Nachkommen waren fruchtbar. und wurden als SBT (= stud book tradition) bezeichnet. Seit dem Jahr 1983 werden Bengal Cats unter diesem Namen bei der TICA registriert. Im Jahr 1985 wurde die Bengal das erste Mal einem großen Publikum vorgestellt und schlich sich sofort in die Herzen der Zuschauer. Die bekannteste F2 Bengal war Millwood Penny Ante. Jean Sudgen, die als Jean Mill dann bekannt wurde, züchtet heute noch diese Rasse unter dem Zwingernamen Millwood. Die Bengal sah man in Europa 1988 das erste Mal. 1992 bekam die Bengal von der TICA den Champion Status. Also known by the name of Feline Bengalensis. Its habitat covers Asia, Indonesia, Bali, Borneo, Java, Sumatra to Malaysia and Nepal. In tropical rainforests as well as in mountain ranges below the snow-line, in semi-deserts and in forests.They are nocturnal animals who feed from small mammals, birds, reptiles and fish. They are excellent swimmers. They are about the size of a domestic cat. They have the same number of chromosomes as our cats; the gastation of appr. 70 days is likewise almost identical. The delivery of the kittens takes place in a hollow tree for instance or a small cave. It all began in America, when biologist Jean Sudgen mated an ALC (= Asian Leopard Cat) with a domestic cat (Felis catus).That, however, was not planned, it merely happened because her ALC was lonely and for that reason she brought a black tomkat for her. Out of that mating she kept a spotted girl called Kin-Kin. This girl was back crossed to her father and she got two kittens from it – a spotted boy and a girl.In 1966 she gave up her first breeding program for private reasons.In the seventies the ALC was part of a testing program.Jean Sudgen kept various spotted F1 females and had all of them registered with the TICA (= The International Cat Association).With those foundation (Latin term: filius) Bengals she started a new program, but many years passed until it was found out that the male F1 Bengal cats were sterile. It was the same story with the male F2 offspring, only the female offspring was fertile.For those reasons they were also crossed with other breeds, like Burmese, Abyssinian and American Shorthair. Even Persian cats were added to the breeding programme back then. Only from the fourth generation were they domesticated and they were given the term SBT (= stud book tradition).Since the year 1983 Bengal cats have been registered with the TICA under that name. In the year 1985 the Bengal cat was presented to a major audience for the first time and it immediately entered the hearts of the crowd.The most well-known F2 Bengal cat was Millwood Penny Ante. Jean Sudgen, who became known as Jean Mill, still breeds this cat today by the kennel name of Millwood. The Bengal cat was seen in Europe for the first time in 1988.In 1992 the Bengal cat was rewarded the status "Champion“ by the TICA. von Asien, Indonesien, Bali, Borneo, Java, Sumatra bis über Malaysia und Nepal. In tropischen Regenwäldern als auch im Gebirge bis unterhalb der Schneegrenze, in Halbwüsten und in Wäldern. Es handelt sich um nachtaktive Tiere, die sich von Kleinsäugern, Vögeln, Reptilien und Fischen ernähren. Sie sind exzellente Schwimmer. Ihre Größe entspricht der einer Hauskatze. Sie besitzen die gleiche Chromosomenzahl wie unsere Katzen; die Tragzeit von ca 70 Tagen ist ebenfalls nahezu identisch. Die Jungen werden beispielsweise in einem hohlen Baum oder einer kleinen Höhle geboren.